“One in a Million,” from Christian Faith Publishing author Tanya Stirling, is a compelling account of the author’s compassionate circumstances in life amid the trials of tragedy and loss. “One in a Million”: a defining opus that shows the author’s resilience and steadfastness in life. 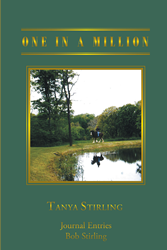 “One in a Million” is the creation of published author, Tanya Stirling. Stirling shares, “One in a Million is a memoir and a personal narrative, but most of all, it is a love story. This is a touching recount of young love found, lost, and then found again a few years later, finally blossoming into a one-of-a-kind, thirty-five-year love affair, only to be tragically lost again by a much too early death. However, that isn’t the end of the story. There won’t be an end, for it will be found one last time on the other side of the veil in Heaven, this time for eternity. Published by Christian Faith Publishing, Tanya Stirling’s new book contains reverberant insights that can aid readers in gaining wisdom on how to live a purpose-driven life. This book is truly an outstanding testament of courage, conviction, and optimism in facing life’s overwhelming challenges. View a synopsis of “One in a Million” on YouTube. Consumers can purchase “One in a Million” at traditional brick & mortar bookstores, or online at Amazon.com, Apple iTunes store, or Barnes and Noble. For additional information or inquiries about “One in a Million”, contact the Christian Faith Publishing media department at 866-554-0919.